I tried their Madam’s Vines Gewürztraminer a couple of months back and liked it; had another bottle yesterday to compare with this. Woo Woo (I’d like to know the stories behind these names) is slightly less expensive at $21.70. Pale green-gold with a light rose-apple nose. A bit more subtle and muted than the Madam’s Vines; medium body with crisp acidity, slightly off dry, and smooth perfume, melon, and honey notes. 13.5% alcohol. See Dirty Laundry Vineyard. Saw this at a local shop and wondered about it; the clerk said it’s a blend of Gewürz and Riesling, which sounds pretty good to me. A medium-light silver-gold appearance with a nice green apple nose. Dry with a nice acidity and melon-apple and slight vegetal qualities; long finish. A bit of a dry French Riesling tone but not strongly so; not outstanding but an enjoyable drink. 12% alcohol. CAD$19.90. See Dopff et Irion. I’ve enjoyed this varietal from Joie in the past; in fact it was the first wine I ever tried from Joie. I’ve since enjoyed their Noble Blend and Rieslings, particularly the 2007 Riesling. This is very clear, almost indistinguishable from water but with a slight silver tinge. Light nose of sage and grapefruit. Light bodied with a nice acidity and a strong lime quality, again with sage—quite different from past years, and quite unlike anything I’ve tasted before, but enjoyable. 10.5% alcohol. $27.10 at Kitsilano Wine Cellar. Pale lemon-gold with a light green fruit-floral nose. Light body, slightly off dry, acidity fading into an appealing apple-ish finish with hints of grapefruit. Very nice. 13.5% alcohol. See Pierre Sparr. $26.50 at Crosstown. Light gold appearance with a light apple-grapefruit nose. Dry light bodied wine with medium-low acidity, straightforward but well balanced citrus. Not an obvious Gewürtz but very drinkable. 14% alcohol. $20.50 at Crosstown (which is beginning to seem a bit overpriced to me). See Lake Breeze Vineyards. I’ve noticed several instances in Vancouver recently of whiteboards and other makeshift signs erected (“plonked” might be a better term) at new facilities in an obvious effort to compensate for poor design. One example is the new extension to the CBC building on Georgia Street: a hand-written sign pointed people to the main entrance, which apparently the architect had neglected to make obvious. 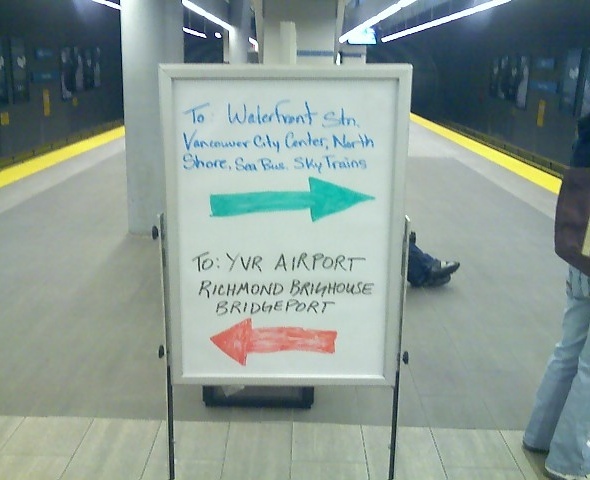 The other day I came across this sign at one of the Canada Line stations. It’s jarring to see such a band-aid on a brand new multi-billion dollar subway line. I’m guessing that no one bothered actually to test to see whether people entering the stations could tell which direction the trains are travelling, perhaps even after checking the overhead red LED signs. I wonder if anyone ever thinks of doing “usability” testing of built environments and wayfinding signage—or the lack thereof. Medium golden-yellow. Nose is a wonderful deep floral-honey. Medium body and quite sweet; great balance of acidity, honey, pears and grapefruit. This is the nectar! 13.9% alcohol. $28.30 at Crosstown. Recommended. See Farmstead Wines. See Spirit Wrestler Gallery; Robert Davidson. My first Ontario Riesling, recommended by James Cluer Selects. Pale green-gold appearance, light honey-apricot mineral nose. Off-dry with low-medium acidity; straightforward stone fruit flavours and a good finish. Very drinkable and compares well with the better BC Rieslings. 11% alcohol. Recommended. See Cave Spring Cellars.